After three straight years of average private sector wages, the Johnson City metro area is back on a roll. According to January’s Bureau of Labor of Labor Statistics report, the average annual private sector wage was up 4.2%. Kingsport-Bristol private sector workers saw an increase of 1.6%. The turnaround in Johnson City follows four straight years of annual decreases. During that time, Kingsport-Bristol saw increases in all but one of those years. That moved Kingsport-Bristol into the position of having the highest average private sector wage in the Tri-Cities. Kingsport-Bristol 2016 average was $648. It was $614 in the Johnson City MSA. As welcome as the improvements were, they didn’t move the local private sector wage off the bottom of the state rankings. 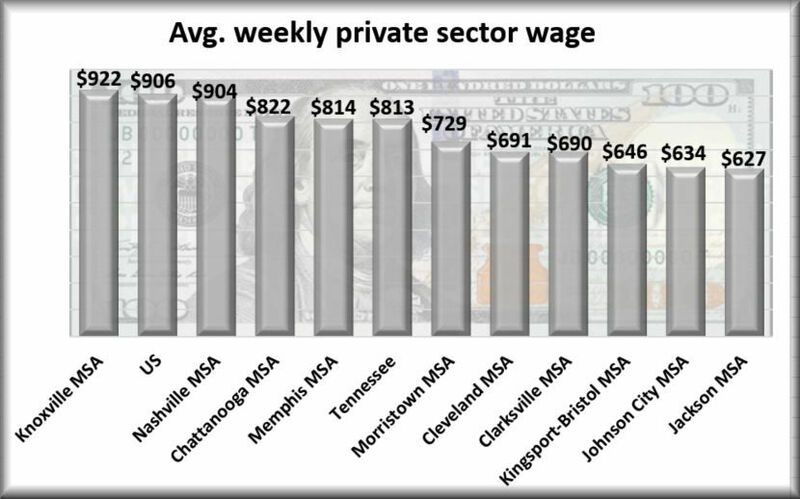 A statewide comparison shows Johnson City metro area had the second lowest weekly average private wage in the state while Kingsport-Bristol was the third lowest. Typically, the state’s four largest metro areas have weekly wage averages above the state average and the six smaller metro areas come in below the state average. Knoxville’s $922 a week average was the highest in the state in January. It was also $16 a week higher than the national average. Morristown’s MSA has the highest weekly wage of the smaller metro areas. When compared to cost of living the difference is negligible. If you are retiring and have a pension then Johnson City is paradise.